Remember when the New York Mets started out 11-1 to begin the 2018 season? We all do, that was the biggest highlight this year. What you may not know, is since then, the Mets have gone 22-58, they went 5-21 in the month of June (third worst month in franchise history), they have lost 12 straight series, and they have officially hit rock bottom as a team and as an organization. While the Mets may technically not be in last place in the NL East just yet, they certainly are playing like it, especially after loosing two out of three this past weekend to the last place Miami Marlins. On the 2nd edition of The SMC Sports Podcast, Sean McChesney addressed the pathetic Mets and how they lost 2 out of 3 to the worst team in the National League. Sean also said that with John Ricco and Omar Minaya in charge, it’s time to sell EVERYONE, even if that means Jacob Jacob deGrom and or Noah Syndergaard. The Mets series in Miami was dreadful for many different reasons. 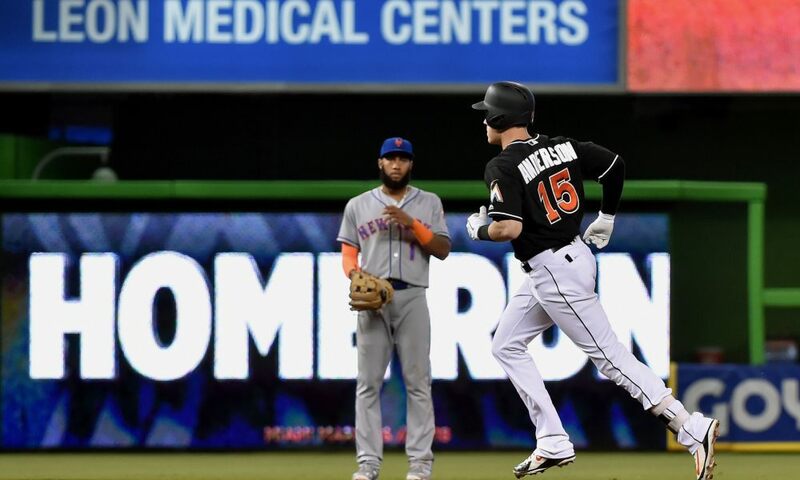 From the offense being anemic, from players not being able to be called upon, to wasting another decent start from Jacob deGrom, all the way to errors all over the field, the Mets looked lifeless in South Beach. The first game of the series on Friday night featured Corey Oswalt come in as an emergency starter in place of deGrom who had a family emergency to attend to. So with deGrom pushed to the following day, Manager Mickey Callaway put his trust in the young Oswalt to see what he can do. Emergency starter, Corey Oswalt, doesn’t make it out of the third. 6-0 Marlins. The second game of the series featured a series of events very common with the Mets this year. It started with deGrom, who had another decent outing pitching six innings giving up three runs. While he would be responsible for the loss, the Mets would once again provide no run support for their ace, leaving five on base, and going 0-4 with runners in scoring position. Their bullpen once again struggled and the defense had its issues in the field which sparked the Marlins’ 5-2 win. While the Mets did get the win in the third game of the series on Sunday, it didn’t come without fans’ holding their breath. The Mets committed three errors in the field, which would make that 22 errors in their last 26 games. The bullpen would also struggle early, but figured out how to settle down and finish off the Marlins. Now, any Mets’ fan would just take a win at this point, as they have lost 10 of their last 12. But, let’s not shy away from how awful they have been as they have historically had their worst first half in franchise history. Technically, today closed the Mets’ worst first half since 1993 (25-56). Two years later, they went 32-49 over their first 81 games, but that was in a strike-shortened season. This year’s club went 33-48, marking the 11th-worst record through 81 games in Mets history. As if that isn’t bad enough, the first half of the season technically isn’t over for two more weeks. The Mets will head north of the border tonight to take on the Toronto Blue Jays for two games. Following that series, the Mets will finish the half at home with three games against the Tampa Bay Rays this weekend, and then will have their hands full with four games against the Philadelphia Phillies and four games with the Washington Nationals to end the half. The Mets realistically could be dead last in the National League come the All-Star Break, in fact, they can actually do that tonight with a loss and a Marlins win. At this point, all the Mets can do is limp as best they can toward the All-Star break in two weeks and hopefully Assistant General Manager John Ricco and Special Assistants J.P. Ricciardi and Omar Minaya start making the necessary moves during that time. Losing 12 straight series is bad enough, but losing the last two in particular against a struggling Pittsburgh Pirates team and the last place Miami Marlins is dreadful and, at this point, typical Mets baseball. The longer this continues, the more everybody is ready to sell, move on, and rebuild the right way. Let’s hope for the first time in a while the fans and the people making the decisions are on the same page. Follow me on Twitter @SMMcChesney to see all my Mets discussion during the 2018 season as well as get involved in the discussion. Also, don’t forget to listen to all my sports discussion on The SMC Sports Podcast as new episodes are posted every week.